Infor CRM 8.3 adds a useful new feature for linking Contacts to Accounts where the Account is not the primary Account for the Contact. This new tab is called “Contact Associations”. 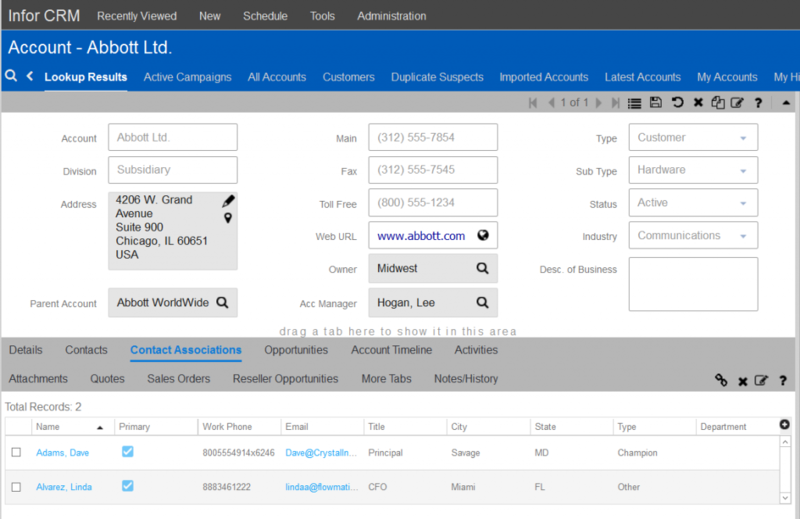 This is in addition to the legacy Associations tab where you could only link records horizontally, Contacts to Contacts and Accounts to Accounts. Now you can link Contacts to multiple Accounts to represent some association they have to that secondary Account. An example of this might be to link a consultant Contact to an Account he is working with or an IT contractor or supplier/vendor. The only thing I wish they would have added is the ability to designate a “Role” for that associated Contact like they have with the legacy Associations tab. A new field could easily be added to the editable grid if you wanted it to do this. Once you navigate to a Contact record, there is a new tab there as well called “Account Associations” which of course shows the links to the Accounts you linked him to. It’s puzzling to me that you cannot create a new linked Account from this tab, you can only do this from an Account, oh well. Does this new functionality have logic behind it so that you can assign a contact to a ticket entered for an account that is not their primary account while avoiding having duplicate contact records? I tested this and it does not work this way. It could be customized to include the associated contacts for tickets. Thanks for this update. This will be beneficial for our company. Was this new feature included in the release notes? Just want to be sure we’re aware of all changes and new features. I did not see it in the release notes.